There is a common belief that most cancer prevention trials should be restricted to high-risk subjects in order to increase statistical power. This strategy is appropriate if the ultimate target population is subjects at the same high-risk. However if the target population is the general population, three assumptions may underlie the decision to enroll high-risk subject instead of average-risk subjects from the general population: higher statistical power for the same sample size, lower costs for the same power and type I error, and a correct ratio of benefits to harms. We critically investigate the plausibility of these assumptions. We considered each assumption in the context of a simple example. We investigated statistical power for fixed sample size when the investigators assume that relative risk is invariant over risk group, but when, in reality, risk difference is invariant over risk groups. We investigated possible costs when a trial of high-risk subjects has the same power and type I error as a larger trial of average-risk subjects from the general population. We investigated the ratios of benefit to harms when extrapolating from high-risk to average-risk subjects. Appearances here are misleading. First, the increase in statistical power with a trial of high-risk subjects rather than the same number of average-risk subjects from the general population assumes that the relative risk is the same for high-risk and average-risk subjects. However, if the absolute risk difference rather than the relative risk were the same, the power can be less with the high-risk subjects. In the analysis of data from a cancer prevention trial, we found that invariance of absolute risk difference over risk groups was nearly as plausible as invariance of relative risk over risk groups. Therefore a priori assumptions of constant relative risk across risk groups are not robust, limiting extrapolation of estimates of benefit to the general population. Second, a trial of high-risk subjects may cost more than a larger trial of average risk subjects with the same power and type I error because of additional recruitment and diagnostic testing to identify high-risk subjects. Third, the ratio of benefits to harms may be more favorable in high-risk persons than in average-risk persons in the general population, which means that extrapolating this ratio to the general population would be misleading. Thus there is no free lunch when using a trial of high-risk subjects to extrapolate results to the general population. Unless the intervention is targeted to only high-risk subjects, cancer prevention trials should be implemented in the general population. Some prevention trials are restricted to high-risk subjects. If the investigators are only interested in the effects of the intervention on subjects at increased risk  or if the study is designed to be a preliminary investigation in preparation for a definitive study in the general population, we think this restriction is reasonable. However some investigators who are interested in studying the effect of the intervention in the general population may be tempted to design a "definitive" study to estimate the effect of the intervention in a high-risk group. Some investigators may believe that a trial of high-risk subjects would have greater power than a trial of the same size among average-risk subjects. Some examples of this type of thinking can be found in papers on risk prediction models [2, 3]. Some investigators may believe that a trial of high-risk subjects with the same power as a trial of average-risk subjects would have lower costs than a trial of average-risk subjects. Some investigators may believe the ratio of benefits to harms can be correctly extrapolated from high-risk to average-risk subjects. Although the rationales for these various beliefs are related, they involve some distinct underlying assumptions that are important to critically examine. Applying these formulas to the above example and substituting either (2) or (3) into (1), the investigators obtain a power of .74 based on the absolute risk difference statistic and a power .76 based on a relative risk statistic [see Additional file 1]. Suppose the investigators think this power is too low. To increase power they propose to restrict the study to a high-risk group in which the probability of cancer is .04. Also suppose the investigators make the typical assumption that if the intervention yields a relative risk of .5 in the general population, it would also yield a relative risk of .5 in the high-risk group. 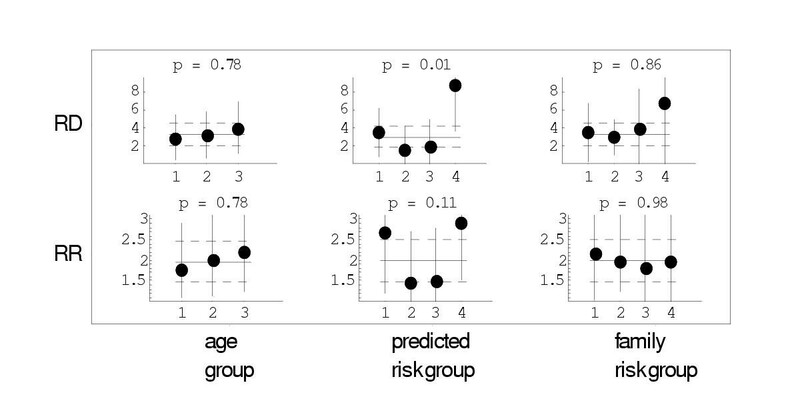 Applying (1–3) with high risk subjects for whom p C = .04 and p I = .02 with n = 2000, the investigators compute a power of .96 using either the absolute risk difference or relative risk. Because the power is higher using high-risk subjects, the investigators plan the study for a high-risk population and will generalize the results to the general population. Is there a free lunch? An underlying assumption in this example is that the relative risk is invariant between the general population and the high-risk group. There is no free lunch because the impact of violating this assumption could be substantial. For example, suppose instead that the absolute risk difference is invariant between the general population and the high risk group. Under this scenario the absolute risk difference in the general population is .01, so the absolute risk difference in the high-risk group is also .01. In this case for p C = .04, p I = .03, and n = 2000, the power (computed using either absolute risk difference or relative risk statistics) for the trial of high-risk subjects is only .41. The decreased power in a high risk group under a constant risk difference model is not surprising: if the risk difference p C - p I is the same, but p I is increasing, the variances, p C (1 - p C )/n and p I (1 - p I )/n, will increase as p C increases up to .5, which will reduce the power. Data from a cancer prevention trial for investigating assumptions of constant risk difference and relative risk when risk groups change. Cancer is invasive breast cancer. Predicted risk is the 5-year predicted risk. Family risk is number of first degree relatives with breast cancer. Data are from Table 5 of  with number at risk computed by dividing number of breast cancers by reported breast cancer rate. where β is the relative risk that varies over groups. We obtained maximum likelihood estimates of δ, δ i , β, and β i using a Newton-Raphson procedure [see Additional file 2]. To investigate the plausibility of the constant relative risk and constant risk difference models in this example, we plotted the estimates of δ, δ i , β, and β i along with confidence intervals (Figure 1). In the top row of Figure 1 we plotted points corresponding to with (100 - 5/k) % confidence intervals and horizontal lines for with 95% confidence intervals. We also presented the p-values corresponding to twice the difference in log-likelihoods for Varying RD versus Constant RD. Similarly, in the bottom row of Figure 1, we plotted points corresponding to with (100 - 5/k)% confidence intervals and horizontal lines for with 95% confidence intervals. We also presented the p-value corresponding to twice the difference in log-likelihoods for Varying RR versus Constant RR. Out of 6 p-values (3 risk factors × 2 statistics) only one, for absolute risk difference under the risk factor of predicted risk had a small p-value (and the p-value of .01 would not be significant at the .05 level under a Bonferroni adjustment of .05/6). Based on these p-values and inspection of Figure 1, the models Constant RD and Constant RR are both plausible, especially for age and family risk. Data from the tamoxifen prevention trial. See text for a description of groups. Horizontal lines are estimates and 95% confidence intervals for model for constant absolute risk difference per 1000 (RD) or relative risk (RR). P-values correspond to likelihood ratio tests comparing the models with varying and constant risk difference or relative risks. The trial designer does not know the true state of nature. If Constant RD is the true state of nature, the power will be lower in the high-risk group than the general population. However if Constant RR is the true state of nature, the power will be greater in the high-risk group than the general population. Thus there is high probability that the power could be reduced when studying high-risk subjects than when studying the general population. Therefore, there is no free lunch in terms of lowering statistical power. when 1244/f - 2529 > 0. If f = .20, the trial of high-risk subjects will cost more than the trial of average-risk subjects if C R /C I > .34. If f = .10, the trial of high-risk subjects will cost more than the trial of average-risk subjects if C R /C I > .13. In many cancer prevention trials the above values of C R /C I are likely. For example, diagnostic testing to identify high-risk smokers can include expensive airway pulmonary function tests or bronchoscopy. In the future, more trials will likely involve expensive genetic testing of subjects  with costs ranging from $350 to almost $3,000 per test according to recent information from Myriad Genetic Laboratories. As part of a sensitivity analysis related to genetic testing of subjects prior to enrollment in a trial, Baker and Freedman  considered values of .1, .5, and 1 for ratios similar to C R /C I . Even without diagnostic testing, the costs of obtaining high-risk subjects can be substantial. If f = .10, the initial recruitment will require ten times the number of people as for a trial of average-risk subjects from the general population. This increased recruitment would likely require higher advertising costs and increased overhead costs from the inclusion of additional institutions. One additional consideration is how noncompliance and contamination affect the intent-to-treat analysis. If noncompliance and contamination can be anticipated, the investigator can correspondingly adjust the sample size and costs. Mathematically the effect of noncompliance and contamination is to change the values of p C and p I in (4), which would then affect (5) and (6). In some settings, investigators may anticipate that high-risk subjects are more likely to comply with the intervention than average-risk subjects. To compensate for the anticipated increased compliance, study designers could reduce the sample size which would lower costs. However, in other situations, investigators may anticipate that subjects found to be at high-risk on a diagnostic test would likely seek the best therapy outside of the trial rather than chance randomization to standard or experimental therapy. To compensate for the anticipated dilution in treatment effect, investigators would need to increase the sample size which would increase the costs. For the above reasons even if the probabilities under the alternative hypothesis are correctly specified, some trials of high-risk subjects may be more expensive than larger trials of average-risk subjects with the same power and type I error. When there is strong evidence prior to the trial of a high probability of harmful side effects due to the intervention, one would want to restrict the intervention to high-risk subjects. Otherwise, some investigators may be tempted to estimate the ratio of benefit to harms in the trial of high-risk subjects and extrapolate the ratio to average risk subjects. Unfortunately, even if the assumption of constant relative risk over risk categories were true, extrapolating the benefit-harm ratio from a high risk group to the general population could be misleading. Suppose that in a randomized trial involving average-risk subjects from the general population the probability of cancer is .02 in the control arm and .01 in the study arm. Also suppose that relative risk is same in the general population as in the high-risk group, so that in a randomized trial involving a high-risk group, the probability of cancer is .04 in the control arm and .02 in the study arm. Furthermore, suppose that the probability of harmful side effects is the same for high-risk subjects as for average-risk subjects in the general population, namely .015 in the control arm and .025 in the study arm. Based on these results, for every 1000 high-risk persons who receive the intervention, (.04 - .02) 1000 = 20 will benefit from the intervention and (.025 - .015) 1000 = 10 will be harmed by side effects, yielding a benefit-harm ratio of 20:10 = 2:1. Similarly for every 1000 average-risk person who receive the intervention, (.02 - .01) 1000 = 10 will benefit from the intervention and (.025 - .015) 1000 = 10 will be harmed by side effects yielding a benefit-harm ratio of 10:10 = 1:1. In this example it would be incorrect to extrapolate the high benefit-harm ratio estimated from the high-risk group to the general population for whom the benefit-harm ratio is much lower. For many cancer prevention interventions, the ratio of life-threatening disease avoided to life threatening harms would be favorable in the high-risk group but not favorable when extrapolated to the general population. There is no "free lunch" when using high-risk subjects in prevention trials design to make inference about the general population. Using high risk subjects instead of average-risk subjects from the general population may lower statistical power, increase costs, and yield a misleading ratio of benefit to harms than actually the case. Given the substantial costs of definitive randomized trials in cancer prevention, and the importance of accurately assessing the balance of benefit and harm when treating healthy and asymptomatic people, it is therefore important to conduct trials in the actual target population rather than try to conduct them in high-risk populations with the plan to extrapolate results to the general population. SGB wrote the initial draft, and BSK and DC made valuable improvements. All authors read and approved the final manuscript.